The 66 remaining players are now on a 10 minute break. When they return, the field will be playing 6,000/12,000 with a 2,000 ante. Players are in the money! With a thunderous applause, the final 90 players are now in the money. 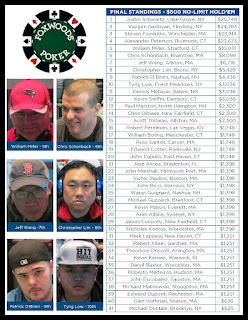 All remaining players are guaranteed $631, but everyone has their eyes on the $45,117 first place prize. With 93 players remaining in the tournament, we are now hand for hand. We will continue to play hand for hand until we are down to the final 90 players, who will then be guaranteed $631. 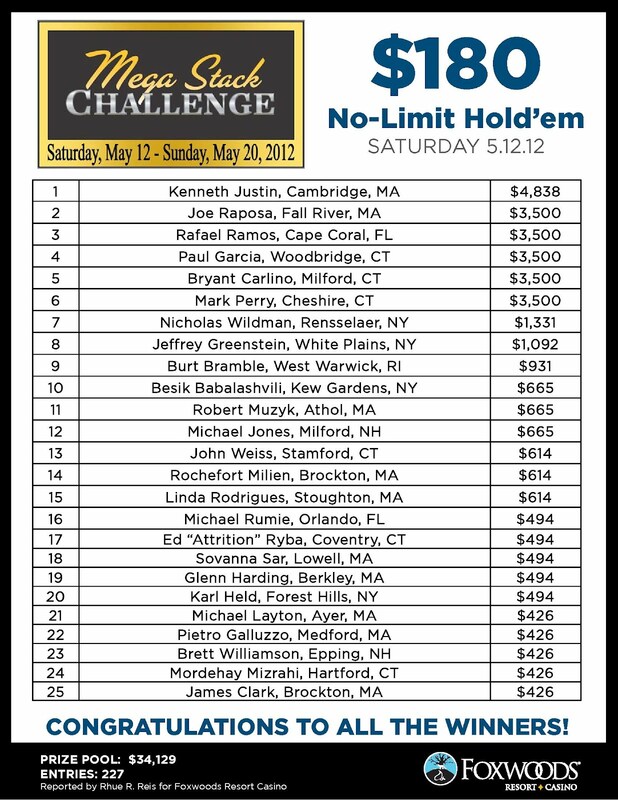 Players are now on a 15 minute break while the tournament staff colors up and races off the 100 chips. When they return, the field will be playing 2,500/5,000 with a 500 ante. The dinner break is complete, and the 171 remaining players have returned to play 1,500/3,000 blinds with a 400 ante. The top 90 players will make the money. The 171 remaining players are now on their one hour dinner break. The tournament will resume at approximately 7:45pm EST, and the field will be playing 1,500/3,000 with a 400 ante when they resume. 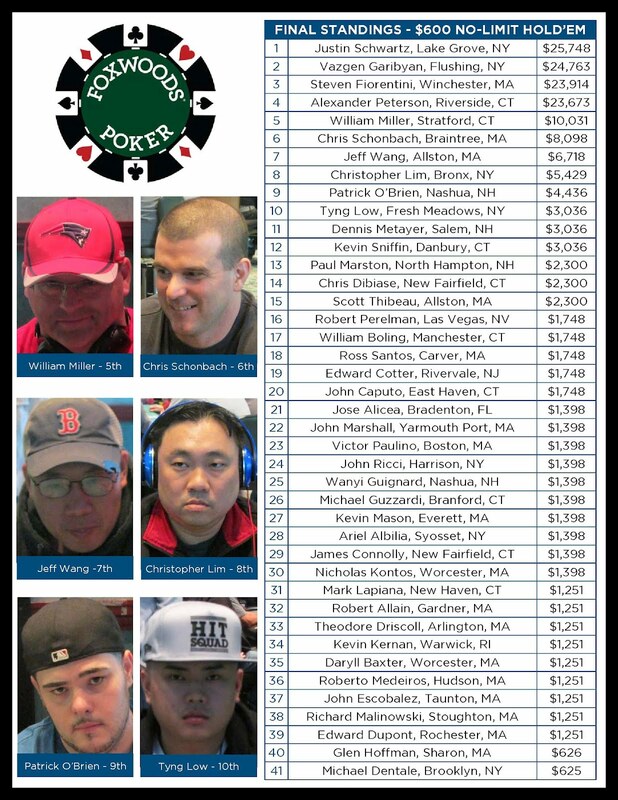 The 270 remaining players from the $300 Mega Stack are now on break. They will come back and play 2 more 30 minute levels, and then they will take their dinner break. Cards are in the air for today's $300 Mega Stack. 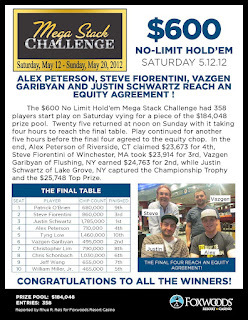 Players start with 15,000 chips and rounds will last 30 minutes. There are already 409 entrants, and late registration is still open. 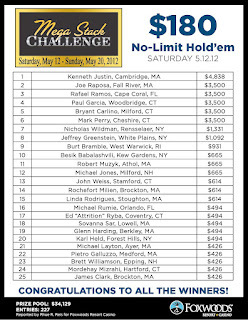 You can watch our live featured table by going to www.FoxwoodsLive.com.